On June 1 and 2, over 50 representatives of 30 organizations gathered in Ottawa for a series of conversations about Canadian civil society and global movements for human rights for LGBTI people. The second day also included presentations and discussions with representatives of Global Affairs Canada and Immigration, Refugees and Citizenship, and a key note address from Parliamentary Secretary for International Development, Karina Gould, MP. 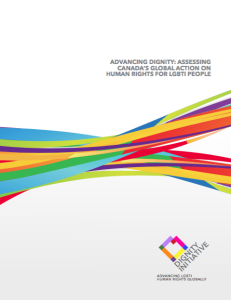 This document will outline promising practices and strategies for Canadian organizations (non-profit, private, and/or public) in supporting human rights work with LGBTI communities abroad. 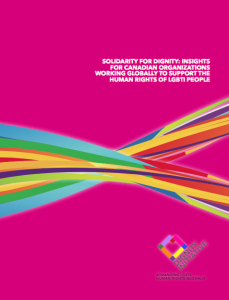 The document will build upon many of the presentations and learnings from the WorldPride Human Rights Conference and will engage with NGOs currently doing this work. The results of this research will be released in summer or fall of 2015. Research Team: Erin Aylward (University of Toronto), Evan Vipond (Bonham Centre, University of Toronto), Doug Kerr. 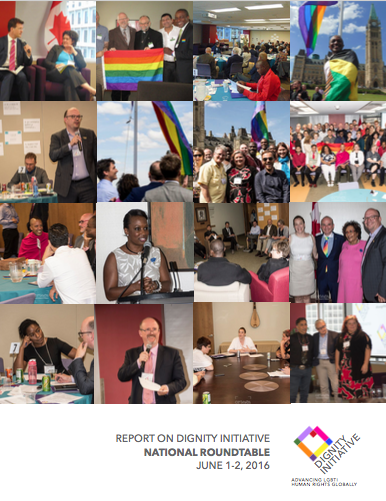 This report is one of three documents written by the Dignity Initiative, a working group of Canadian civil society organizations and individuals interested in supporting the human rights of lesbian, gay, bisexual, trans and intersex (LGBTI) communities around the world.